The thought of making a cold call, which is an unsolicited phone call, as part of your career networking strategy makes most people cringe. But you’ve got nothing to lose by being brave and trying to make a few calls. 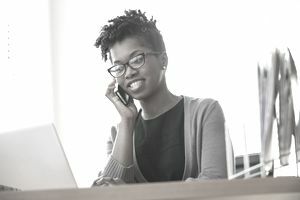 When done carefully and professionally, cold calling can help you to grow your career and get hired for your next job. There is no doubt that career networking works. It’s one of the key ways job seekers get hired. Your network of professional contacts, college and university connections, and personal friends and family can help you get your next job. It’s not only the people you know well - or at all - who can be instrumental in aiding your job search. Your broader network is important too. What can be difficult is figuring out who to ask for help and how. How you reach out to contacts in your wider network is one of the most important factors impacting the success of your job search. Reaching out to individuals who don't know you well and capturing their attention can be particularly challenging. Preparing a pitch that will encourage the person you’re contacting to meet with you is an important first step. You may need to sell them on why they should take the time to help you. You can make it easier for them by asking for just a few minutes of their time and being clear that you’re only requesting advice, not a job. Emphasizing a common thread linking you to the contact can make it even more likely that the person will be motivated to speak with you or meet you. It can be easy to send an email or LinkedIn message, and that’s a fine first step. However, a phone call isn’t as easily ignored as an email, and it can be a more effective way to begin building a relationship with your contact. 1. Make every effort to generate referrals and solid leads. Good prospects include LinkedIn connections, former supervisors and coworkers, college faculty and classmates, family contacts, members of professional groups, fellow parishioners, neighbors, and everyone you can think of who might be able to help. 2. Send a message in advance to help make your contact more receptive to your call. Send an email or LinkedIn message with some of the information mentioned here. You can include a resume as long as you mention something like "I have attached my resume to make it easier for you to advise me." Mention that you will call to explore the possibility of arranging an informational consultation. Here's an example of a letter requesting career advice. 3. Practice a brief introduction or elevator pitch prior to your call. Begin by mentioning how you identified the person as a potential contact. If you were referred by one of their contacts, you should lead with that information. You might write "I am reaching out to you upon the suggestion of John Smith. John thought that you could provide valuable feedback regarding how best to frame my background for jobs in college admissions." Review these tips for writing an elevator pitch. 4. Mention how you are connected. If you haven't been referred to your contact, part of your leading statement should include a reference to any commonality in your backgrounds. For example, you might mention that you attended the same college, belong to the same professional association, participated in online discussions for the same group, or grew up in the same area. 5. Your introduction should also include a clear statement regarding what you are requesting from the individual. The type of advice you request might include insights on how to position your background for opportunities in their sector, roles that might be suitable given your skill set, feedback on your resume, or perspective on trends in their field. 6. Ask for help and advice, not for an interview. With cold contacts, your reason for reaching out to the individual should be for advice and to arrange a consultation. You should never ask a potential networking contact (who doesn't know you yet) to get you an interview. 7. Your initial statement should convey three or four assets that make their sector a logical area for you to explore. For example, you might say "I am investigating roles in which I can apply my passion for writing and editing, and my fascination with digital media." 9. When logistically possible, ask for the opportunity to meet face-to-face before you end your call. If you represent yourself well at in-person meetings, you'll be more likely to generate referrals for interviews or further networking opportunities. Suggest a meeting at their workplace so you'll gain a clearer sense of the work environment. You also might receive introductions to colleagues while you're there. Here's how to make your networking meeting a success. 10. Follow up your call with a thank you communication expressing gratitude for any advice received. Provide any additional information that might help your contact to gain a further appreciation of your background. Include a link to a personal website or LinkedIn profile that contains work samples and recommendations. Review this list of thank you letter examples for a variety of circumstances. Cold calling isn’t just for networking contacts. Even though it isn’t always easy, cold calling can help get you noticed by employers and aid career networking. With planning and persistence you may be able to engage employers on a more meaningful level than you could using online messaging and email alone. At least, your application materials will get a closer look. At best, your willingness to reach out could help you be selected for a job interview. That’s especially the case when you’re seeking a role in which cold calling is required.